Magnificent custom home on one of the best cul-de-sac streets in Canyon Crest. 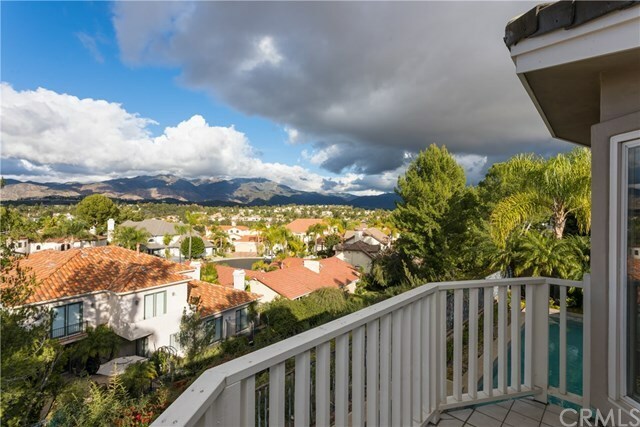 Panoramic city lights and Saddleback Mountain views from most of the home. Huge 5 bedrooms with 3.5 baths and over 4000 square feet of luxury. Enter from double metal door to formal foyer with beautiful spiral staircase with a round skylight on top. Huge formal living room and dining room. Elegant family room with vaulted ceiling and beautiful built-ins. Remodeled kitchen with newer appliances and granite counter tops. Main floor bedroom and full bathroom. Romantic master suite with fireplace, balcony with city lights and mountain views and custom built-ins. Remodeled master bathroom with top of the line upgrades. Large secondary bedrooms. Entertainers back yard with Pebble pool & spa with waterfall. Built-in BBQ island and fire pit. Sitting area with TV. Possible dog run on both side of the yard. All bathrooms have been remodeled. Over $300,000 in recent upgrades. Turn key and move in condition. Extra-large three car garage with sectional door. Low taxes of 1% and low association dues. Association offers pool, spa, club house, gym, sauna, tennis, and sport courts. Gated community across from Lake Mission Viejo. Truly a beautiful place to call home.